Sometimes it's worth it to follow celebrities on Snapchat, just to see their private plane content. It's voyeuristic and so delicious to imagine what life would be like if you had a full bed, comfy armchairs, pillows, and blankets every time you flew the friendly skies. In real life, you're probably in a middle-back row on a packed commercial plane, with no clue how to get some shut-eye in the sky. 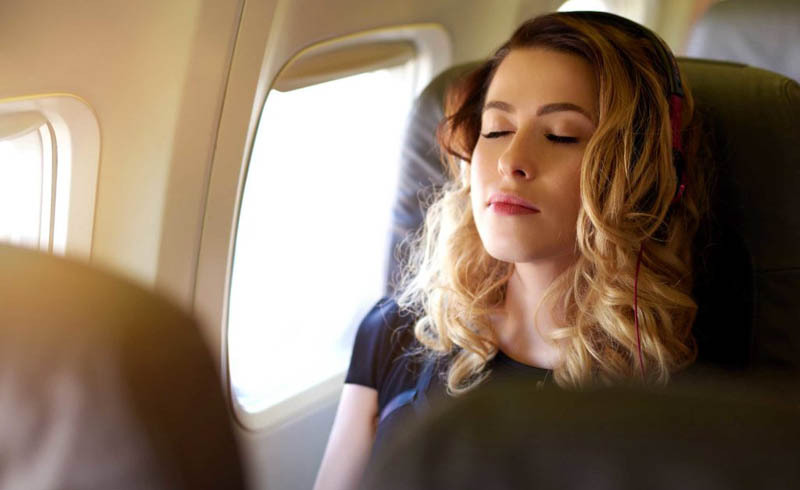 There are a few reasons why it's so hard to sleep on the plane: It's noisy, you're confined to a small space, and most people can't sleep sitting upright, says Nitun Verma, MD, a sleep physician at Crossover Health in San Francisco, and spokesperson for the American Academy of Sleep Medicine. "Also airplanes have lower levels of oxygen and humidity, and that can make people uncomfortable," he says. But the good news is there are ways to make the experience more comfortable — that don't require access to a private jet. Ahead, Dr. Verma shares his tips for sleeping on a plane. The best sleeping position on a plane is whatever's most comfortable for you, "but the goal would be to get as close to horizontal as possible," Dr. Verma says. So, if you can recline your chair back, go for it. If that's not doable, try to stretch your legs so they're as extended as possible, he says. Get a sturdy neck pillow. The main purpose of a neck pillow is to keep your head from flopping to the side, which can cause muscle spasms and narrow your airway, making it harder to breathe, Dr. Verma says. But many neck pillows can't actually keep your head upright. "Sometimes I see soft pillows that appear to be comfortable, but I doubt how well they can keep the head upright," he says. Opt for something that will provide that support, like the Ostrich Pillow Go. Be wary of sleep drugs. Many people turn to OTC drugs that they know will knock them out for a long flight, like Benadryl, Advil PM, Tylenol PM, and Nyquil, Dr. Verma says. But if you're flying domestic, then Dr. Verma recommends not taking these meds. "The medicine lasts a long time — longer than the flight," he says. "You want to avoid being sleepy after you land for sure." That said, if you are flying internationally (or flying somewhere longer than eight hours), then it might be okay. If you're taking a red-eye flight, then you should spend the day of trying to make yourself sleepy, Dr. Verma says. "It's a little aggressive, but one thing you could do is avoid naps and caffeine the day of the red eye," he says. The goal is to be as tired as possible by the time you're actually getting on a plane. Planes are really loud. 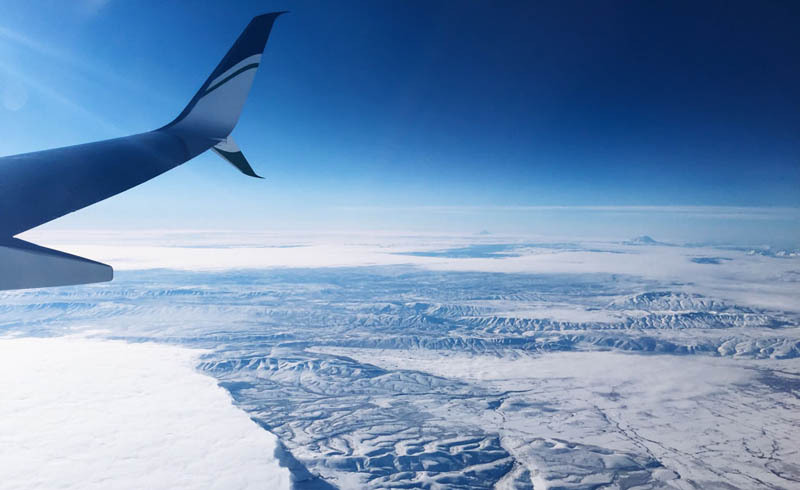 At takeoff, the noise is about 105 decibels, which is as loud as a siren, and at cruising it's 85 decibels, which as loud as a vacuum cleaner running, according to the American Speech-Language-Hearing Association. So, you can imagine how that could interfere with your sleep. Dr. Verma recommends wearing ear muffs or ear plugs to block out the external noise. "There are a lot of kind of noise-cancelling headphones out there, but usually an ear plug is much more blocking," he says. Most people are pretty stressed or high-strung by the time they actually board the plane, which makes it even harder to fall asleep, Dr. Verma says. "A good thing people can do right as they settle into their seat, would be to do some kind of relaxation or breathing exercise to bring some of that heightened energy down back to Earth," he says. Exposure to light can mess with your body's melatonin, which is the hormone responsible for regulating your sleep-wake cycle, according to the Mayo Clinic. During the actual flight, it's a good idea to wear an eye mask to block out any excessive light. Then, once you've landed at your destination, spending time in sunlight can help reduce the effects of jet lag. If you can get a window seat, that's your best bet for sleeping, because you can lean against it, Dr. Verma says. But if you don't have the option to select your seat ahead of time, he suggests asking to be seated in an exit row, so at least you can have some extra leg room. Comfort is key when you're trying to fall asleep. While you might want to show off a trendy look when you get off the plane, dressing in comfortable clothing that you'll actually want to sleep in is better than anything constricting.